Upon reading the title, some of you may be puzzled as to why anyone in their twenties would proudly admit to driving a minivan, let alone enjoy it. Hear me out before you think I'm crazy! I was once anti-minivan too. I could not fathom the idea that I would ever drive a van. EVER! 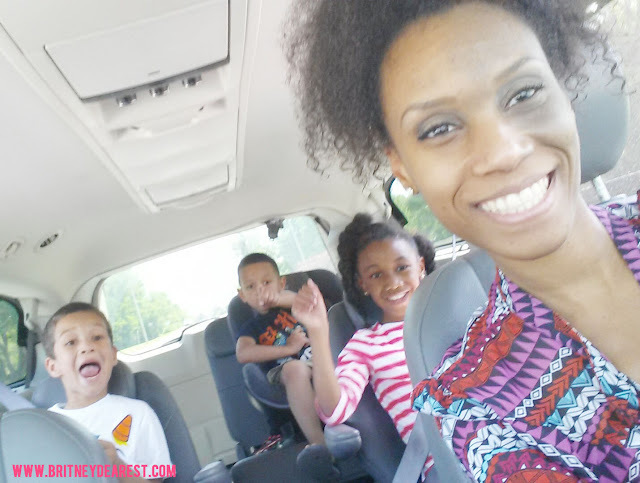 A minivan wasn't the right vehicle for this hot, young mama. In 2011, during the last month of my pregnancy with my youngest son, my family owned two small cars; my husband's black manual 2-door Scion tc & my 4 door Chevy Cavalier. My husband had bought his car brand new and customized and it was his 'baby'. He dreaded the thought of selling it, but knew it was time for a newer, family-friendly vehicle. I never ever considered a minivan as an option. I was actually searching for a 7 or 8 passenger SUV. My dreams were shattered when my husband said something like, "babe, we're not getting an SUV, we need a van." I probably replied something like, "honey, you have lost your mind if you think I'm gonna be seen driving a VAN." Then, because he's Mr. Logical, he explained all the reasons why a van would be the most practical choice for our family. He was right, but I probably said, "screw that, I'm too young and fly to drive a van!" I was ridiculously dramatic on the way to the dealership. I guess reality had set in. I don't know if it was my postnatal breastfeeding hormones or what, but I cried (literally) and debated with my husband during the entire ride. I realized I may have lost my battle against the minivan and the possibility that I could really be driving one by the end of the day was over whelming for me. I know it seems silly, but I was really stressed out! I wasn't sold on it until the test drive. 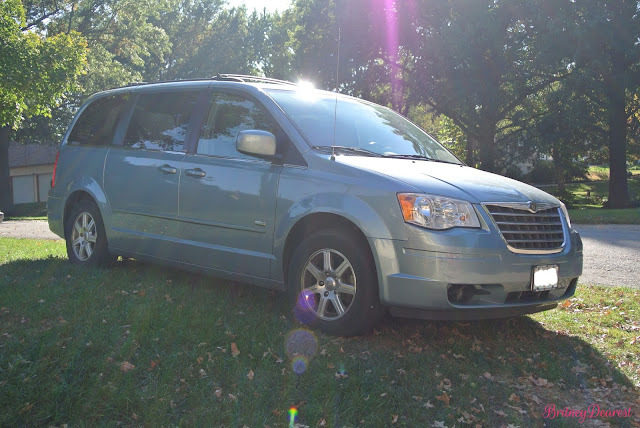 Needless to say, my husband and I became owners of a 2008 Chrysler Town & Country Limited minivan by the end of that day. I named it Pearl, because of it's pretty, light blue pearly color. Although my ideas of driving a minivan didn't start out so well, I have made it to a great place and now, it's all love and light. 1. Nice aesthetics. Everything on the inside and outside was close to perfection. It looked brand spanking new. The previous owner kept the vehicle in great condition. 2. It drives so smooth. During our test drive, my husband and I were blown away by how smooth the ride was. It was so much better than what we were used to. It still rides pretty good. 3. Entertainment for the kids. 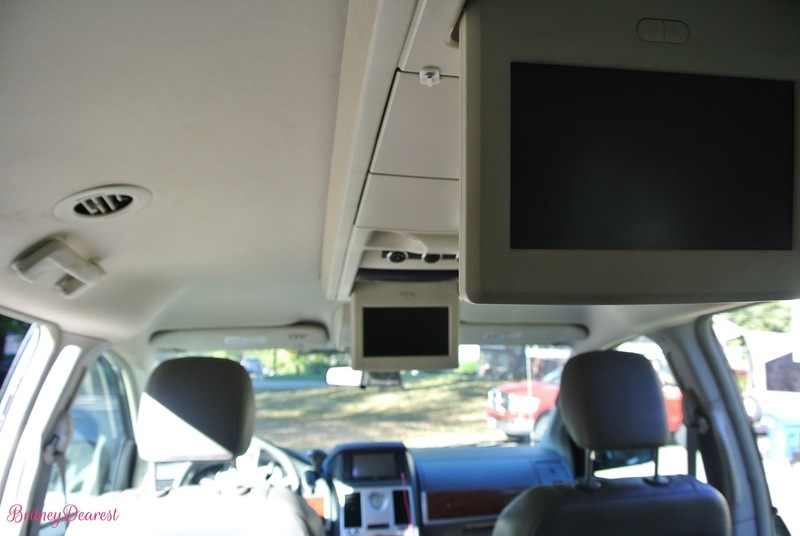 Our van has two TV screens that fold down from the ceiling of the van, a remote, and two Bluetooth headphones so I can ride in silence or listen to the radio while the kids listen to their movie. Every now and then we're offered three free months of SiriusXM satellite radio. I love it! I can't wait until the offer comes back around again. Using an auxiliary cord, I can hook up my phone and listen to my own music via YouTube, Pandora, or any other internet radio apps. We also have an electrical power outlet we can turn off and on in the second row. 4. Rear view screen. 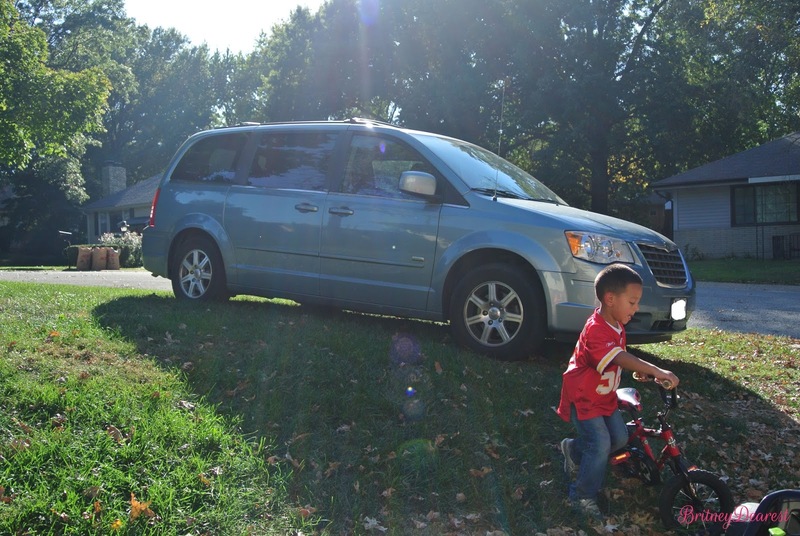 My kids leave out their bikes and toys in the driveway pretty often, so when I open the garage, I can check the rear view screen to make sure there's nothing and no one behind the van before backing out. It's beneficial in parking lots because in addition to my rear view mirrors, I have another way to check for other vehicles and people walking by. The screen also allows me to control the radio and has the ability to show a movie while the van is in park. 5. It has automatic sliding doors that open and close with the push of a button. Yeah, SUV's are nice at all, but automatic sliding doors are a great feature they lack. I feel like I'm living in luxury when my kids and I are leaving the grocery store, and I tap the button to slide the doors open for the kids before we make it to the car. Instantly following that, I tap the button to open the trunk for the groceries. 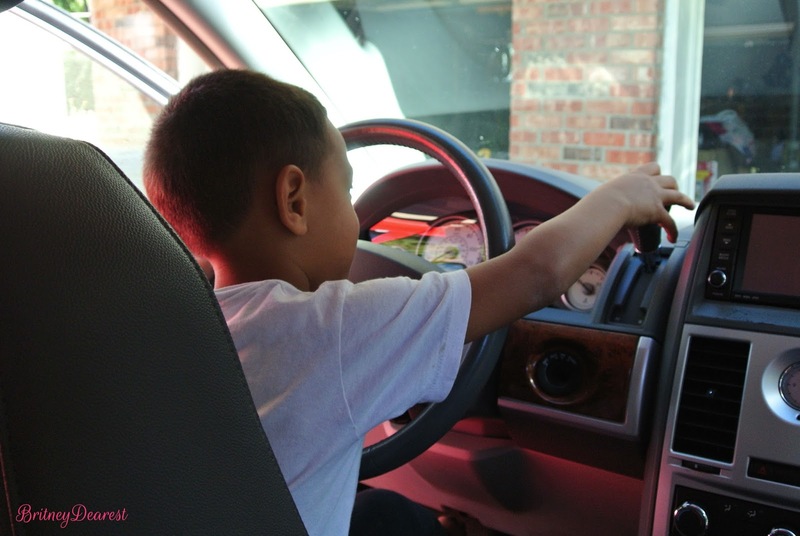 Then, I tap the button again to close the trunk, while my kids tap the button located inside the van to close the doors. I get that "I'm so fancy" attitude. While I'm in the back, slaving away. 6. Because of the sliding doors, I don't have to worry about my kids swinging doors open and scratching or denting cars nearby. 7. Stow-n-Go seating is great. Instead of removing seats, we're able to fold them down into the floor. It has been great for big purchases. I can put a few seats down to load a large item. We have also used the seating at the drive in, changing the trunk into comfortable seating and a spot to lie down. The larger front row storage compartment has DVDs, change, hand sanitizer, lotion, car sprays, stuff like that. 8. There are useful storage compartments, including a nice sized trunk. There are two glove compartments on the passenger side and two nice sized storage compartments in between the driver and passenger seats. I store DVD's in the larger one and and stuff like loyalty/reward savings cards, baby wipes, lotion, & feminine products in the smaller. 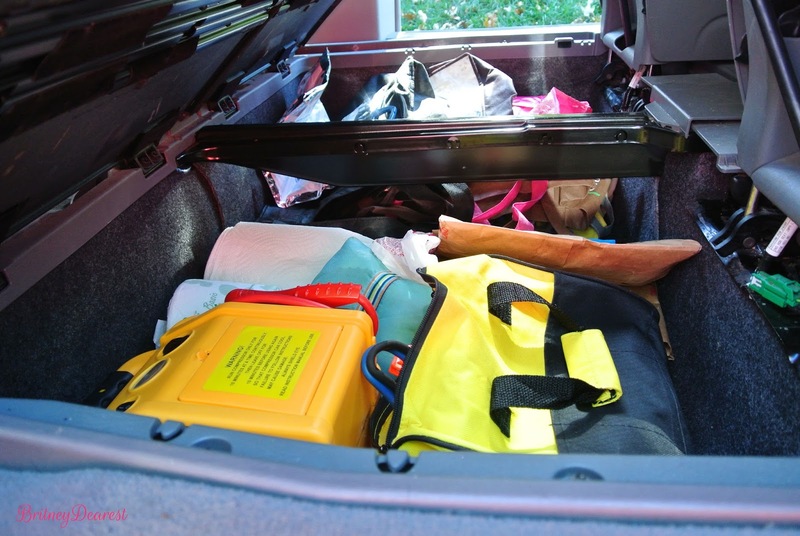 I keep my emergency kits and reusable grocery bags in the floor compartments located in the second row. 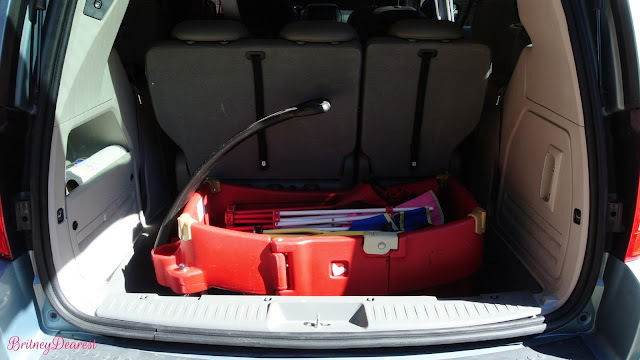 We're able to fit our groceries, wagon, bikes, and scooters in the trunk with ease. 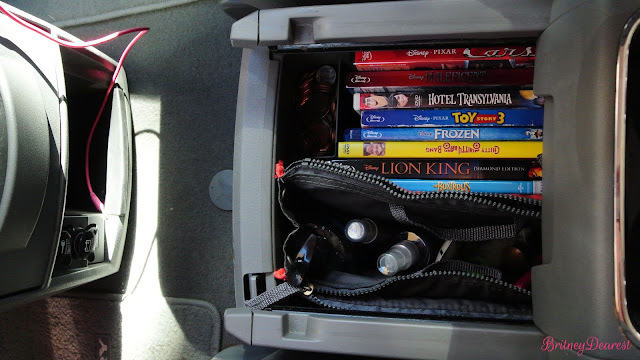 In the third row, there's a few holders and areas where the kids store a few of their small toys. 10. Heated Seating. 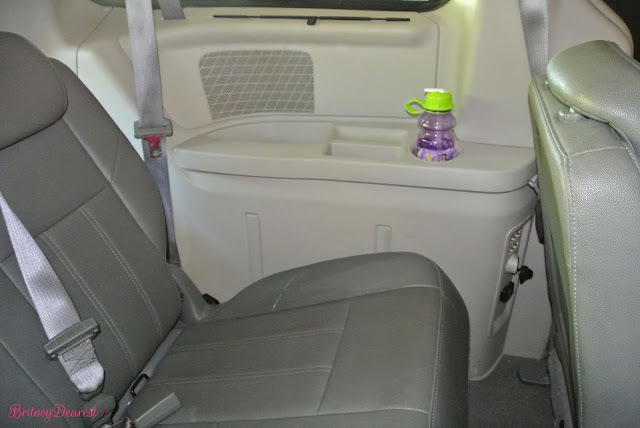 The driver, passenger, and second row seats have heated seating. It's perfect for the colder seasons! Not only am I able to keep my backside warm, but my kids can keep theirs warm as well. Our emergency kits, reusable bags, and other stuff in the floor. 11. My family loves having a van. My entire family is spoiled by the perks that our Pearl offers. I don't want any other type of vehicle. I would love to upgrade to a 2016 Town & Country. They're so sleek and gorgeous, inside and out. I considered a 2015 Honda Odyssey; for awhile, it was actually my dream family car, however, when I saw the newer Town & Country, with chrome accents and new logo design, I fell deeply in like. Third row. Snapping photos as I clean! Having a van has most definitely changed my opinion. I was so hesitant to own one, but now, I don't want anything else. Well, I would like to have a nice 4-door mid-size sedan, eventually, in addition to my van, but it's not feasible for us right now, so the other alternative we have currently is my husband's Chevy truck. This post is also featured on TheChicSahm.com. I've always wondered what the thought process was behind getting a mini van! Now I know. It seems to fit your family well and that's definitely what it should do! Yeah, from all the "van moms" I have talked to, it's all about practicality and what works best for them. Glad you are happy with your decision. My husband and I also had to get a larger vehicle due to our two boys but I like you was against a minivan. We settled on a Honda CR-V and it works for us. However, everyone I know who has given in and purchased a minivan says they are awesome. Who knows...maybe next time we are in the market for a car we will take the plunge. NICE i wish my van had stow and go! love it thanks for sharing! Oh yeah. I was crazy and went DOWN in size recently from an SUV to a sedan. I don't know what I was thinking! I have van envy...especially in carpool line! LOL! Too funny! Well, hopefully you'll have the opportunity to upgrade sooner than later :-) Thanks for reading Allie! When we lived in Asia we had a van and I LOVED it! I felt safe, the body was metal and it was an easy ride! I feel you! I have never thought about point number 6! My sister wants a minivan and I tease her about it all the time. Yep, I'm in the anti van category. However, after reading your post, I may reconsider it if we do decide to have kids some day.